This document outlines Without Walls’s Data Sharing policy. Without Walls requires all project partners who share data with the organisation to sign a dedicated agreement form, which will be sent to relevant partners prior to the project. Please read the policy in full – depending upon the nature of your interaction with Without Walls, different aspects of this policy will be more relevant to you than others; this policy is designed for all of our service users and clients who interact with us in different ways. Without Walls Consortium Ltd. is incorporated as a Company Limited by Guarantee, with the Company Number 06231874. The organisation’s registered address is Without Walls Consortium c/o XTRAX, 51 Old Birley Street, Hulme, Manchester M15 5RF, United Kingdom. Without Walls understand that your personal information and privacy is important to you. It will make every effort to ensure that the information you share with it is recorded accurately, retained securely and used only according to your wishes. Without Walls protects your personal information and adheres to all current data protection act legislation with respect to protecting privacy. Without Walls does not give out, sell or trade our mailing list data with external organisations. Without Walls is committed to looking after any information that you make available to it in accordance with data protection and privacy laws. This applies whether the information is obtained directly from individuals via the organisation’s website by completing online forms or by making online bookings to any of its training/networking events, or by other means such as phone calls, e-mail, printed forms, or in person. It also applies to information obtained from publicly available sources. Without Walls Consortium Ltd is managed by XTRAX Arts Ltd. XTRAX is the Data Controller and is responsible for any personal information Without Walls may collect about you. This policy outlines whose information Without Walls collects, what information it collects, how it collects it, and what it does with it. Whose information does Without Walls collect? Other enquirers, to improve upon our sector support we log all enquiries made and monitor their outcome. What information does Without Walls collect? How does Without Walls collect the information? Mailing list: Without Walls uses a third-party provider, Mailerlite, to deliver its newsletter. Without Walls uses Mailerlite software to help gather statistics on opening rates and clicks on links, which help monitor and improve the organization’s communications. Individuals can unsubscribe at any time from newsletters by clicking the unsubscribe link on each e-newsletter. Mailerlite’s privacy notice can be viewed here. 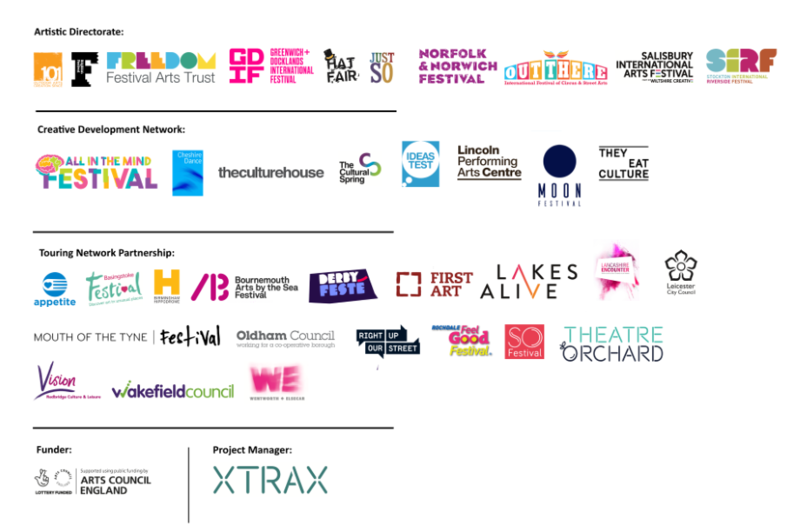 Applying to participate in and/or seek commissioning support from one of our projects. What does Without Walls do with the information? Without Walls will process your personal data for our legitimate business interests and for the performance of your contract with the organisation. There is a legitimate interest. For example, where Without Walls requires your data to pursue a legitimate interest in a way which might reasonably be expected as part of running the business and which does not impact your rights, freedoms or interests. Without Walls may use the information you provide to undertake analysis and evaluation projects. Sometimes this means gathering information from publicly available resources (e.g. the electoral register, press, the charity register) or by using a third party to help report on audiences, stakeholders, donors, subscribers and supporters (such as where Without Walls audiences come from, or the demographic profiles of the organisation’s event attendees). Without Walls never share personally identifiable information with third party suppliers and a list of the organisation’s suppliers can be provided on request. Without Walls will ensure that all personal data you supply is held safely and securely and in accordance with data protection and privacy laws, including the new General Data Protection Regulation (GDPR). Without Walls does not sell or otherwise transfer personally identifiable information to any third parties unless you have consented to this or this is permitted by law. Without Walls will store your information for a period of time depending upon the nature of your interaction with Without Walls. Information on artistic output, audience statistics and evaluative reports will be held indefinitely. Personal data will be held for a period of two years after the working relationship has ended. Once your data has been deleted Without Walls will not inform you that this has taken place and should you interact with Without Walls after the deletion of your data the organisation will hold it for another two years after the completion of the relationship. Request access to your personal information (commonly known as a “data subject access request”). This enables you to receive a copy of the personal information Without Walls holds about you and to check that the organisation is lawfully processing it. Request correction of the personal information that Without Walls holds about you. This enables you to have any incomplete or inaccurate information held about you corrected. Request erasure of your personal information. This enables you to ask Without Walls to delete or remove personal information where there is no good reason for the organisation continuing to process i.t You also have the right to ask Without Walls to delete or remove your personal information where you have exercised your right to object to processing. Object to processing of your personal information where Without Walls are relying on a legitimate interest (or those of a third party) and there is something about your particular situation which makes you want to object to processing on this ground. You also have the right to object where the organisation is processing your personal information for direct marketing purposes. Request the restriction of processing of your personal information. This enables you to ask Without Walls to suspend the processing of personal information about you, for example if you want the organisation to establish its accuracy or the reason for processing it. You will not have to pay a fee to access your personal information (or to exercise any of the other rights). However, Without Walls may charge a reasonable fee if your request for access is clearly unfounded or excessive. Alternatively, the organisation may refuse to comply with the request in such circumstances. Without Walls may need to request specific information from you to help confirm your identity and ensure your right to access the information (or to exercise any of your other rights). This is another appropriate security measure to ensure that personal information is not disclosed to any person who has no right to receive it. You have the right to request a copy of the information Without Walls holds about you. If you would like a copy of this information, please contact Without Walls by email to info@withoutwalls.uk.com or by post to Without Walls Consortium c/o XTRAX, 51 Old Birley Street, Hulme, Manchester M15 5RF. Without Walls wants to make sure that your information is accurate and up to date. You may also ask the organisation to correct or remove any inaccurate information. Without Walls includes the option for you to update your details or unsubscribe from our mailing list every time the organisation sends you an e-newsletter or send you information in the post. Without Walls uses a number of different cookies on this site. These are necessary cookies that are essential in helping users to move around the website and use its features such as events bookings; and performance cookies, that collect information about how users use the site, such as which pages are the most visited. These cookies only collect anonymous information and only use any information to improve the site. Third party cookies are set by other sites; for example, if a video has been embedded from YouTube, YouTube may set a cookie of its own.